By October 14, the trenches were within 150 yards (140 m) of redoubts #9 and #10. Washington ordered that all guns within range begin blasting the redoubts in order to weaken them for the coming assault. Redoubt 10 was near the river and held only 70 men, while redoubt 9 was a quarter of a mile inland, and was held by 120 British and Germans. Both redoubts were heavily fortified with rows of abatis surrounding them along with muddy ditches which surrounded the redoubts at a distance of about 25 yards. Washington devised a plan in which the French would launch a diversionary attack on the Fusiliers redoubt, and then a half an hour later, the French would assault redoubt 9 and the Americans redoubt 10. Redoubt 9 would be assaulted by 400 French Regular soldiers under the command of Lieutenant Colonel Count William Deux-Ponts and redoubt 10 would be assaulted by 400 troops under the command of Alexander Hamilton. There was briefly a dispute as to who should lead the attack on redoubt #10, Lafayette named his aide, the Chevalier de Gimat, to lead the attack, but Hamilton protested, saying that he was the senior officer. Washington concurred with Hamilton and gave him command of the attack. At 6:30 pm, gunfire announced the diversionary attack on the Fusiliers redoubt. At other places in the line, movements were made as if preparing for an assault on Yorktown itself, which caused the British to panic. With bayonets fixed, the Americans marched towards redoubt #10. Hamilton sent John Laurens around to the rear of the redoubt to prevent the British from escaping. The Americans reached the redoubt and began chopping through the British wooden defenses with their axes. A British sentry called a challenge, and then fired at the Americans. The Americans responded by charging with their bayonets towards the redoubt. They hacked through the abatis, crossed a ditch and climbed the parapet into the redoubt. The Americans forced their way into the redoubt falling into giant shell holes from the bombardment of the redoubts. The British fire was heavy, but the Americans overwhelmed them. Someone in the front shouted "Rush on boys! The fort's ours!" The British threw hand grenades at the Americans with little effect. Men in the trench stood on the shoulders of their comrades to climb into the redoubt. The bayonet fight cleared the British out of the redoubt and almost the entire garrison was captured, including the commander of the redoubt, Major Campbell. In the assault, the Americans lost 9 dead and 25 wounded. The French assault began at the same time, but they were halted by the abatis which was undamaged by the artillery fire. The French began to hack at the abatis and a Hessian sentry came out and asked who was there. When there was no response, the sentry opened fire as did other Hessians on the parapet. the French soldiers fired back, and then charged the redoubt. The Germans charged the Frenchmen climbing over the walls but the French fired a volley, driving them back. The Germans then took a defensive position behind some barrels, but when the French prepared a bayonet charge, the Hessians threw down their arms and surrendered. With the capture of redoubts 9 and 10, Washington was able to have his artillery shell the town from three directions and the allies moved some of their artillery into the redoubts. On the October 15, Cornwallis turned all of his guns onto the nearest allied position. He then ordered a storming party of 350 British troops under the command of Colonel Robert Abercromby to attack the allied lines in order to spike the American and French cannons. The allies were sleeping and unprepared. As the British charged, Abercromby shouted "Push on my brave boys, and skin the bastards!" The British party spiked several cannons in the parallel and then spiked the guns on an unfinished redoubt. 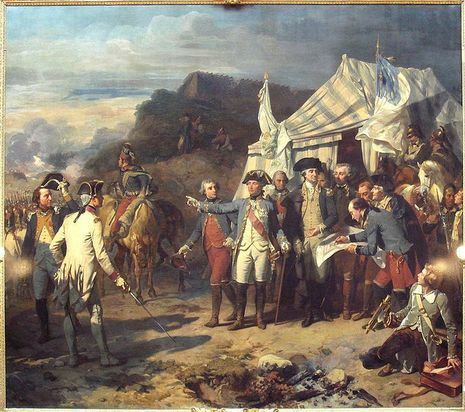 However, a French party came and drove them out of the allied lines and back to Yorktown. The British had been able to spike six guns, but by the morning they were all repaired. The bombardment resumed, with the American and French troops engaged in friendly competition to see who could do the most damage to the enemy defenses. On September 28, the combined Continental and French forces left Williamsburg at around 5:00 A.M. They moved to within a mile of Cornwallis' Yorktown defenses by dark. The siege of Yorktown had officially began. On the British right, Lt. Col. Robert Abercromby withdrew as the French Wing advanced there, while Tarleton withdrew as the American Wing moved to the southeast of Yorktown. 1. Rochembeau commanded the 7,800-man French contingent. They occupied the left wing, or northwestern sector, of the siege line. It consisted of 3 infantry brigades, a heavy cavalry corps, and a large artillery corps. 2. The American troops formed the base of the right, or southern sector, with two wings of 8,845 troops. These were divided into 3 divisions. They were commanded by Brig. Gen. Benjamin Lincoln, and Maj. Gens. Marquis de Lafayette and Baron von Stueben. Col. Henry Knox was in command of the artillery, engineers, sappers and miners. Col. Stephen Moylan was in command of the cavalry. 3. The third division of 3,200 Virginia militiamen were commanded by Brig. Gens. George Weedon, Edward Stevens, and Robert Lawson. They occupied the southeastern sector, or far right wing of the siege line. The siege line was initially established 2 miles below Yorktown in a giant arc, with the French on the west/right and the Americans on the south/center and east/right. Additionally, Washington dispatched 4 regiments, commanded by Compte Claude G. de Choisy to the northern side of the York River to lay siege to the British troops operating on Gloucester Point. There, Weedon's 1,500 Virginia militiamen, aided by 1,400 French troops under Duke de Lauzun, joined forces to bottle up the British. 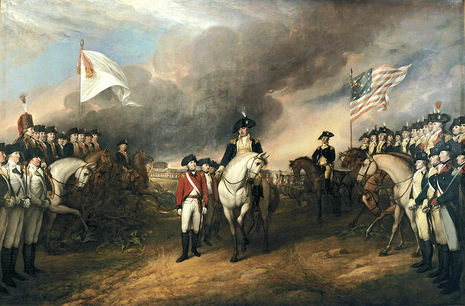 On September 29, Washington inspected the British position while the army continued to surround Yorktown. Artillery and siege equipment and stores were also brought to the front. The Americans in the eastern sector began reconnoitering the area and a minor skirmish broke out at Wormeley Creek. The British fell back to their trenches and the Americans broke contact. On September 30, Cornwallis received a message from Lt. Gen. Henry Clinton promising some reinforcements and the return of the British fleet to assist him. These reinforcements would be leaving New York on October 5. Convinced that he could hold out until then, Cornwallis abandoned 3 outposts on the outer line that had covered the southwest approach to Yorktown. He would concentrate his troops within the inner fortifications, maximizing the defenses with his limited forces. Washington then learned of this information shortly after it happened and had his men occupy the abandoned works. Across the York River at Gloucester, Brig. Gen. George Weedon and his 1,500 Virginia militia had been opposing the British garrison commanded by Lt. Col. Thomas Dundas. A heavy skirmish occurred west of the Fusilier's Redoubt between the British and French forces. On October 1, de Choisy assumed allied command of these operations while 800 marines were detached to Gloucester as well. On October 2, Tarleton's Legion arrived to support Dundas, bringing the British garrison's strength to nearly 1,000 men. On October 3, Dundas was returning to camp after leading a foraging expedition when de Choisy pushed forward. Cavalry from Lauzon's Legion formed an advance for de Choisy, while Tarleton's cavarly formed a rear screen for the British. Tarleton was nearly captured when he was pinned under his horse, but some of his men rode in and saved him. He reassembled his men, but some American militia, commanded by John Mercer, held the allied line and Tarleton withdrew his men back into their defensive lines. He would not see any more action on the American continent. For the remainder of the campaign, de Choisy kept the British garrison at Gloucester pinned. On October 6, the allied force commanded by Washington and de Rochambeau was ready to begin formal siege operations. While Comte de Saint-Simon's troops began a diversion on the left toward the Fusiliers Redoubt on the north side of Yorktown in the evening, engineers staked out the main operations. This diversion helped focus attention on that distant flank and away from the digging of the first parallel. 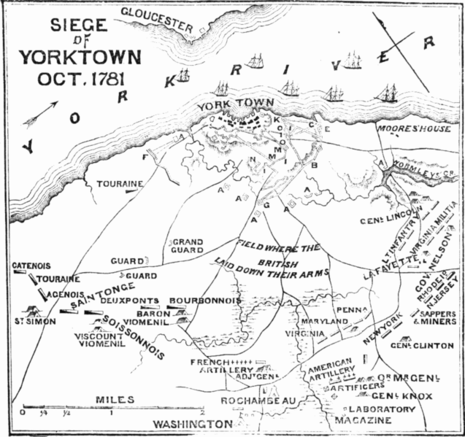 On October 9, after the completions of the first parallel, the bombardment of Yorktown began with Saint-Simon firing the first shots at 3:00 P.M. This fire also managed to drive off many of the British ships anchored off Yorktown. On October 10, 46 guns were in place and inflicted so much damage that Cornwallis was only able to return about 6 rounds an hour. A flag of truce appeared at noon. That evening, 3 or 4 ships were destroyed by the allied fire. On October 11, a second siege line was begun. This line was about 750 yards long and was within musket and easy artillery range of the British main line. At dusk, digging was begun in preparation for an assault on Redoubts No. 9 and No. 10 on the southeast side of Yorktown, which was necessary to complete the second tighter parallel. On October 12, at dawn, Cornwallis spotted the second siege line. He sent some of his force to engage the workers on the line. The British managed to drive the workers to the ground and temporarily brought the work to a halt. On October 14, Lafayette was given responsibility for the capture of Redoubt No. 10 and he selected Jean-Joseph de Gimat to lead the assault, but Brig. Gen. Alexander Hamilton protested. Washington ruled in Hamilton's favor and Hamilton was to lead 400 men against Redoubt No. 10. Col. William Deux-Ponts led the assault on Redoubt No. 9 with 400 French grenadiers and chasseurs. Saint-Simon and de Choisy began diversionary attacks on the Fuselier Redoubt and Gloucester at 6:30 P.M. Hamilton and Deux-Ponts moved forward at 8:00 P.M. After taking heavy losses, Deux-Ponts secured Redoubt No. 9 as the British and Hessian defenders surrendered. Meanwhile, Hamilton had quickly overrun Redoubt No. 10 with few casualties in only 10 minutes. The allies immediately consolidated their positions in anticipation of a British counterattack. However, Cornwallis did not counterattack, but massed all his artillery against the newly captured position. That night, the Allies began incorporating the two forts into the right wing of the second parallel. The batteries could now fire and hit any point within Yorktown. On October 16, at about 4:00 A.M., Lt. Col. Robert Abercromby led 350 British troops on a sortie to spike allied guns now in position in the center of the second parallel. He was able to spike 4 guns after pretending to be an American detachment. Moving to another position along the parallel, the British were this time driven back to their lines by a French covering party. However, they had managed to spike 2 more guns, but the allies were able to get all the spiked guns back into action within 6 hours. In the evening, Cornwallis ordered an evacuation of his troops to Gloucester Point. He decided to attempt a breakthrough and a march northward to New York. Bad weather, a lack of adequate transports, and being bombarded by the American-French force forced him to abort the effort. Cornwallis now knew that he was out of options. On October 17, the Allies brought more than 100 guns into action for their heaviest bombardment yet. Cornwallis could no longer hold out for reinforcements from Clinton. Around 10:00 A.M., a parley was called for by the British. Washington gave Cornwallis 2 hours to submit his proposals, which were received by 4:30 P.M. that afternoon. On October 18, during the morning, terms of surrender were negotiated with Dundas and Maj. Alexander Ross represented Cornwallis and Lt. Col. John Laurens and Noailles represented the allies. On October 19 , the surrender document was delivered to Cornwallis. He was to sign and return it by 11:00 A.M. and the garrison was to march out at 2:00 P.M. to surrender. Sometime before noon, the document returned with Cornwallis' signature as well as Capt. Thomas Symonds, the highest ranking British naval officer present. Washington and Rochambeau as well as de Barras signed for the allies. The terms of the surrender were honorable. The British were to march out with colors cased and drums playing a British or German march. The principal officers could return to Europe or go to a British-occupied American port city on parole. Officers were allowed to retain their side arms and all personnel kept their personal effects. Infantry at Gloucester could ground their arms there, while the cavalry including Simcoe and Tarleton were to proceed to the surrender field outside Yorktown. All troops would be marched to camps in Virginia, Maryland and Pennsylvania. At 12:00 P.M., two detachments of 100 men each, one American and one French, occupied 2 British redoubts to the southeast of Yorktown, while the rest of the victorious army formed along both sides of the Hampton Road where the British Army would march to the surrender field, which was located about 1.5 miles south of Yorktown. 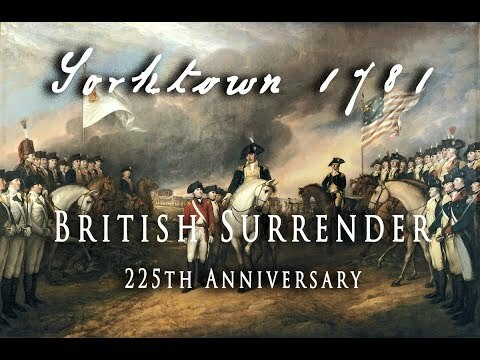 At 2:00 P.M., the British and Hessian defenders of Yorktown officially surrendered. The defeated troops marched down the road, supposedly to the tune of "The World Turned Upside." About 2,000 of the surrendered troops were sick or wounded and unable to march. However, 7,157 soldiers, 840 sailors, and 80 camp followers walked out. The formal surrender ceremony has become a legend unto itself. Cornwallis was not present, but had remained at Yorktown claiming illness. He was represented by his second-in-command, Brig. Gen. Charles O'Hara. He first attempted to surrender to de Rochambeau, but he refused and pointed him to Washington. Washington's only reaction was to ask him to surrender to his own second-in-command, Lincoln. The British and German troops grounded their arms with some of the British soldiers obviously drunk. Washington did not witness the surrender proceedings, but remained at his post along the road a few hundred yards away. The British soldiers and sailors were sentenced as prisoners of war and sent to prison camps in Virginia and Pennsylvania. The victory cemented Washington's legend as the father of the country in America, while the defeat sorely damaged Cornwallis more so than Clinton. On October 27, Clinton had finally arrived at the Chesapeake Bay but discovered that the battle was over. It is improbable that Adm. William Graves would have been able to fight through the French fleet to even land Clinton's 7,000 strong relief force. Clinton returned to New York City and remained there until he was recalled to England in 1782. Losing his grip on the Carolinas, Cornwallis marched his army into Virginia and seized Yorktown and Gloucester, towns on each side of the York River. The Americans and French marched out of Williamsburg and arrived before Yorktown on 28th September 1781, forming a semi-circle around the entrenchments and putting the British under siege. Cornwallis expecting Major General Clinton to sail from New York with a relieving force had decided to remain in Yorktown rather than march south to the Carolinas or attempt to reach New York. His first move was the inexplicable one of abandoning a line of four redoubts that dominated the British positions. The Americans immediately occupied the empty redoubts. On 14th October the Americans and French stormed two redoubts in front of their trenches and the position of the British in Yorktown became untenable. The British carried out a sortie on the 16th in which several guns in the two redoubts were spiked. On the same day Cornwallis attempted to pass the Guards, the 23rd and the Light Infantry across the York River to Gloucester but was thwarted by a storm. 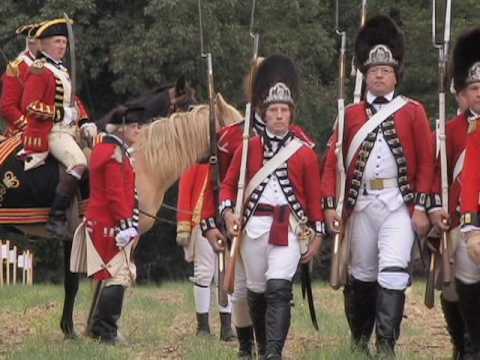 With no sign of Clinton’s relief and with inadequate supplies of artillery ammunition and food, on 19th October 1781 Cornwallis’ army marched out of Yorktown and surrendered.